Our wines offer a classic Bourgogne-style blend of our Dijon clones, but with more prominent oaking than our Tryptique wines. Our wines are aged for up to 18 months in new and second-use, light-to-moderate toast French oak barrels to develop an extended tannin structure and add an underlayer of leather and cigar to the wine’s natural fruit flavors. Like all our wines, wines are released only after achieving full maturity in the bottle, with their tannin structure enabling extended cellaring, possibly for a decade or more. See below to learn about our currently available and expected future releases of . The 2011 ’s cool-season pinot structure has integrated beautifully in the bottle with the toasty overtones and tannin structure provided by the 15 months spent in new French oak barrels. A confident wine with a deep, complex structure and extended spectrum of flavors that readily engage the senses. 45 cases produced. 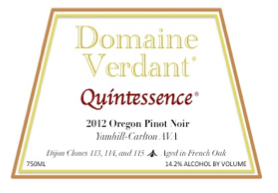 The 2012 offers a spectrum of nuanced pinot flavors developed during the relatively mild 2012 growing season. The pinot flavors have gracefully integrated with the tannin structure and spices derived from 15 months spent in second-use French oak barrels. 46 cases produced. The 2013 ’s warmer-season berry flavors have melded beautifully in the bottle with the toasty overtones and tannin structure provided by the 15 months spent in new French oak barrels. A confident, engaging wine with a complex structure and extended spectrum of flavors that readily engage the senses. 145 cases produced. The 2014 is exhibiting deep fruit flavors that were conferred by the relatively warm 2014 growing season and that have nearly fully integrated with the tannin structure and spices conferred by 10 months in new and second-use French oak barrels. 200 cases produced. Anticipated release in Fall 2015.